Be the first to share your favorite memory, photo or story of J. Frederick. This memorial page is dedicated for family, friends and future generations to celebrate the life of their loved one. J. Frederick Leetch, 89, of Bowling Green, Ohio, passed away on October 9, 2018. He was born to Anna (Kemper) Leetch and James Frederick Leetch I, September 27, 1929, in Butler, PA. Fred graduated with a BS from Grove City College, a MS in Mathematics and PhD in Mathematics and Statistics from Ohio State University (1961). He married Nancy Alice Wikoff (Hazel Annetta Bidlack and Charles Henry Wikoff) in 1958 in Columbus, Ohio. In 1961 they moved to Bowling Green, where Fred taught Mathematics and Statistics and retired as Professor Emeritus in 1990. Fred served as a Naval Officer on both a destroyer and an aircraft carrier during the Korean War and retired as a Captain after 30 years. After retirement from teaching, he worked at True Value Hardware Store, was a Master Gardener and woodworker. A gentle and loving man with a wry sense of humor, he is survived by his wife, Nancy, daughters Alice Annette Leetch (Brett Oberholzer), Cincinnati and Elaine Marie Leetch Albright, Bowling Green; and grandchildren, Celia Leetch Oberholzer, Columbus; Daria Leetch Oberholzer, Cincinnati; Jacob Allen Albright, Hartville; Kacy Marie Albright, Brunswick; and Jessie Lynn Albright, Bowling Green. Fred and Nancy traveled to Paris, France for a barge trip on the Seine and took part in many Elerhostel trips together. A "Renaissance Man," Fred loved making wooden toys for his grandchildren when they were young and made musical instruments from gourds, which he grew, dried and decorated. Fred was a musician able to play many instruments and played the piano by ear. 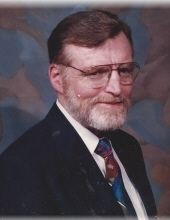 He taught youth sailing and built sailboats for the Optimist Club and loved sailing on Sand Lake, MI, where the Leetch family had a summer house. Fred took printmaking classes at BGSU, always donated blood and was an avid squash player. He also entered the Wood County Fair in many different categories and helped in the woodworking booth there. A Celebration of Life is planned for 11:00 AM on Saturday April 6, 2019, at the Bowling Green Country Club. Arrangements have been entrusted to Dunn Funeral Home, located in the Historical District of Bowling Green, Ohio at 408 West Wooster Street. (419)352-2132. Memorials may be made to the Wood County Library, the Wood County Humane Society or to a charity of the donor’s choice. To send flowers or a remembrance gift to the family of J. Frederick Leetch, please visit our Tribute Store. "Email Address" would like to share the life celebration of J. Frederick Leetch. Click on the "link" to go to share a favorite memory or leave a condolence message for the family.